Muhammad, who posted his thoughts in an approximately 45-minute Facebook Live video, was reacting to Yellowhammer News’ article from earlier that day that revealed he was leading the Hoover boycott efforts in the wake of Emantic “E.J.” Bradford, Jr.’s death in an officer-involved shooting at the Riverchase Galleria on Thanksgiving night. “[W]hat’s happening in Birmingham is just a sign of what’s going to be happening all across America,” Muhammad said. He called Yellowhammer News “the enemy” and reaffirmed that the Nation of Islam’s involvement leading the Hoover boycott was part of a bigger plan. Locally, this is an opportunity for them to immediately advance their agenda. “Boycott Hoover and build up black Birmingham,” Muhammad summarized. Again using the term “the enemy,” he affirmed that the Nation of Islam’s efforts were to be a “war” against the City of Hoover and its citizens, however Muhammad emphasized they were not advocating violence. 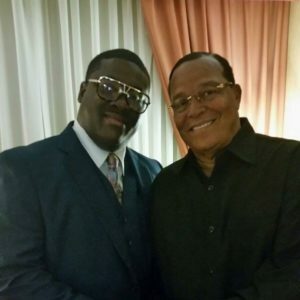 In the video, Muhammad then read a definition of “war” and then explained that he would continue using the word to describe the Nation of Islam’s efforts in Hoover and the Birmingham metro area. “The creation of the City of Hoover was an act of war against Birmingham,” Muhammad reflected. “By black people – no. By the masses of white people – no. By the Southern Poverty Law Center. Stop right there,” Muhammad retorted. “I’ve got a question for you. Did Farrakhan bring you into slavery?” Muhammad asked his followers. The organization’s doctrine, which is shunned by mainstream Islam, also holds that black people’s destiny is to wrestle control of the world back away from these “devils” and put them in their supposed rightful place. In the Bible, in the Book of Revelation, it talks about the fall of Babylon. It says Babylon is fallen because she has become the habitation of devils. We believe that that ancient Babylon is a symbol of a modern Babylon which is America. “Trying to force brother Carlos [Chaverst] to say he’s not with [us], trying to force me to say I’m not with him, but we are family. … Even if we disagree, we’re not going to disagree in front of you, Yellowhammer,” Muhammad said. While his method of rebuttal throughout most of the video was to lash out at the SPLC, the ADL, Yellowhammer News, etc., simply saying they were lying and challenging them to “prove it” throughout, the clearest example of his struggle with the truth came during his version of Malcolm X’s assassination, which was quite unequivocally false. Many have blamed the organization for his assassination, with three of its members being convicted in his killing. The so-called ringleader of the three, who confessed to firing upon Malcolm X, was promoted to become the head of the Nation of Islam’s Harlem mosque after his release from prison. “Prove it!” the Muhammad emphasized, ending his claims about the assassination. The facts do not support Muhammad. Three Nation of Islam members were convicted of the murder. Talmadge Hayer (Thomas Hagan), Norman 3X Butler and Thomas 15X Johnson were all convicted. Hayer maintained the other two charged were innocent but a decade after his conviction admitted four other Nation of Islam members participated in the killing. Malcolm was shot 21 times. All three of the convicted men were eventually released from prison, despite life sentences. Butler, today known as Muhammad Abdul Aziz, was paroled in 1985 and became the head of the Nation of Islam’s Harlem mosque in 1998. In prison Johnson, who changed his name to Khalil Islam, rejected the Nation of Islam’s teachings and converted to Sunni Islam. He was released in 1987. Hayer, who also rejected the Nation’s teachings while in prison and converted to Sunni Islam, is known today as Mujahid Halim. He was paroled in 2010. Nevertheless, Muhammad decried that his followers were being misled – and not by him. “[W]hen you throw these lies out here and then our people read it, and some are young and don’t necessarily know the history, or you may be a little ignorant, I’m not being disrespectful, ignorant of the ways or the history of the Nation of Islam and you may believe what they say, that’s why I gotta come out here and knock out the brains of falsehood,” Muhammad claimed.